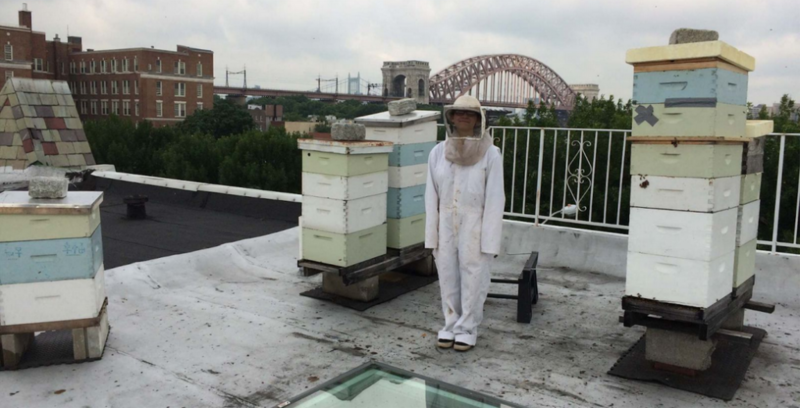 Devora Najjar collecting samples from hives in Brooklyn. Elizabeth Hénaff. 2015. What does it mean to design for multiple species? When we do not, are we committing unknown crimes? Increasingly, architects, biologists, designers, and technologists are working to produce more bio-receptive and symbiotic environments—but not without some tumultuous stories. Interrogation Series: Across Scales and Species brings together these experts and others to reveal the effects of the built environment and microbiological ecologies on genetic landscapes, from urban spaces to our bodies. In the form of a deposition, participants will answer a series of questions that serve to interrogate our current understandings of design amidst potentially delinquent and entirely human-centered design practices. In 2010, a 50-year-old maraschino cherry factory in Red Hook, Brooklyn developed a colorful problem: bees across the city were producing red honey, attracting all sorts of attention. Fast forward five years, and the story grew to include the Brooklyn District Attorney, the Department of Environmental Conservation, a 2500 square foot marijuana growhouse, and a suicide. It played out amidst parallel concerns around food safety, insect health, and industrial runoff in a strange biocriminal saga that reaffirmed our collective indebtedness to bees. Drawing on the latent detective prowess of bees, a team of experts from MIT, NYU, Cornell, and The Cooper Union came together to install hives around the city in 2015 as part of a project called Holobiont Urbanism. The apiaries positioned bees as metagenomic sensors that could collect data about the microbial communities found within their flight ranges. This burgeoning field of research reveals origins, actions, and destinations of humans and animals in neighborhoods around the city, shedding light upon entirely new species and ecosystems as well as methods for fighting pollutants present in the air and water. Storefront’s current exhibition, Subculture: Microbial Metrics and the Multi-Species City questions the common perceptions of our interactions with the microscopic world, providing insight into the future of design, from data science to material science. It proposes future-oriented practices of data collection and interpretation that can produce new modes of environmental perception. To read more about the installation and exhibition, see Subculture: Microbial Metrics and the Multi-Species City. Prior to Interrogation Series: Across Scales and Species, Dr. Elizabeth Hénaff will lead the first of two workshops entitled Bioinformatics for Environmental Metagenomics. To read more about the workshop, see HERE. The Interrogation Series employs the format of an interview, deposition, or Q&A to evince and implicate emerging modes of thought within institutionalized practices. With the presumption that a crime (a book, building, photograph, thought…) has been perpetrated, a dialogical exchange documents a testimony with an open-ended verdict, be it confession, indictment, or exoneration. Ariane Lourie Harrison is an architect, educator, and co-founder of Harrison Atelier. Ariane has taught at the Yale School of Architecture since 2006, in the graduate and undergraduate studio and design sequences and in the graduate history/theory sequence. She is also currently teaching at Pratt Institute GAUD in the MS Arch program. She is the editor of Architectural Theories of the Environment: Posthuman Territory (Routledge, 2013). Ariane worked at Eisenmann Architects (May 2006 through August 2008). She is the editor of Ten Canonical Buildings by Peter Eisenmann (Rizzoli, 2008). Ariane received her Ph.D in architectural history from the Institute of Fine Arts NYU with a thesis titled, “Mass-Produced Aura: Thonet and the Market for Modern Design, 1930-1953″. She received her M.Arch from Columbia University and an AB, summa, in architectural history from Princeton University. She is a LEED AP and registered architect in the state of New York. Dr. Elizabeth Hénaff is a computational biologist and assistant professor at the NYU Tandon School of Engineering. At the center of her research is a fascination with the way living beings interact with their environment. She has made contributions to understanding how plants respond to the force of gravity, how genome structure changes in response to stress, and most recently has turned her attention to the ubiquitous and invisible microbial component of our environment. This inquiry has produced a body of work that ranges from scientific articles in peer-reviewed journals, to projects with landscape architects, to working as an artist in environments from SVA to the MIT Media Lab. She teaches courses in BioDesign in the Integrated Digital Media department at NYU Tandon. The Living (led by David Benjamin) is a design studio and an experiment in living architecture. Its work focuses on expanding the definition of environmental sustainability through the frameworks of biology, computation, and a circular economy. The studio has won design awards from the American Institute of Architects, the Architectural League, the Mies Crown Hall Americas Prize, the Museum of Modern Art, Ars Electronica, the German Federal Government, and Holcim Foundation. Recent projects include the Embodied Computation Lab (a new building for research on sensors and robotics) and Hy-Fi (a branching tower made of a new type of biodegradable brick). A monograph about the studio, Now We See Now: Architecture and Research by The Living, will be published by The Monacelli Press in Fall 2018. The studio team is: David Benjamin (Founding Principal), John Locke, Danil Nagy, Damon Lay, Dale Zhao, Jim Stoddart, Ray Wang, and Lorenzo Villaggi. Kevin Slavin was the Founding Chief Science and Technology Officer for The Shed as well as the Founder of the Playful Systems group at MIT’s Media Lab, where he retains a Research Affiliate title. As an entrepreneur, he has founded and co-founded several companies, including Area/Code, one of the earliest pioneers of geolocative gaming, acquired to become the New York office of Zynga in 2011. He is one of the founding editors and is on the Editorial Board of the MIT Press Journal of Design and Science, and is on the board of The Cooper Union, where he was Vice-Chair between 2014 and 2016. He co-developed the Urban Computing class at NYU’s ITP. and has taught at ITP, Cooper Union, MIT, and Fabrica, among others.